Your efforts, commitment and dedication to public safety and our safety in the field does not go unrecognized! You truly are the "first" first responders who not only has the job of keeping the public safe, but also has the job of keeping EMS, Firefighters and Law enforcement safe! THANK YOU for all that you do, we could not be successful in the field without you guys having our backs behind the radio console! Congratulations to the Fire 1&2 graduates class 19-2! We are especially proud of two of our firefighters in this class for all of their hard work to complete the course. We wish all of the students a bright future. Today was a stark reminder that spring storm season is upon us! At approximately 0900 this morning, Hillsboro Fire Station one took a direct hit from a lightening strike. A first alarm was struck due to smoke in the firehouse. After checking the building, no fire was found thankfully. The lightening traveled through a piece of anntena coax into the engine bay. A piece of ceiling was blown out. The strike traveled through a water pipe blowing it out at an elbow causing a water leak. A television, a computer work station and pieces of our computer system all sustained damage. Luckily no one was injured. A big thanks to all the mutual aid companies who responded to help us out today! We are back up and fully ready to respond to your emergencies! Not every firefighter goes home at the end of their shift. Our thoughts and prayers are with our brothers and sisters of the Godfrey Fire Protection District tonight as they mourn the loss of one of their own, Captain Jacob Ringering. Captain Ringering made the ultimate sacrifice yesterday while fighting a house fire. We also wish Godfrey Firefighter Luke Warner who was injured at the same fire a very speedy recovery. We were excited to have the Cub Scout Troop 547 visit Station 1 yesterday! They were able to talk with Firefighter Kyle about fire safety, see the fire trucks, and cheered on our Jr. firefighters during a gear race! ​If you travel past our station 2, you will notice the hand drawn hose cart on display in front of the building has been repainted. Hand drawn hose carts like this one were used in the late 1800s through the early 1900s in small towns that did not have pumper trucks to transport hose to the fire scene. Once it was pulled from the fire station, firefighters would connect one end of the hose to the hydrant, and then pull the cart toward the fire to supply the scene with much needed water. Your Hillsboro firefighters are taking the opportunity to train today with DeSoto Rural Fire Protection District and Mapaville Fire Protection District in an Ice Rescue class by Trident Rescue LLC. Also a big thank you to the community of Lake Wauwanoka for allowing us to use their lake. Strong work out there gentlemen! Thank you to everyone who came out to donate with us! We collected 18 units of blood! Santa has been making appearances around Hillsboro's neighborhood in the fire truck! Santa has been helping the Hillsboro Firefighter's Association collect nonperishable food items to be donated to the Hillsboro Food Pantry. View the flier below to see when he will be in your neighborhood. Everyone can benefit from taking a CPR and First aid class. We will be offering these classes once a month, every month. CPR only is $6 per person and CPR and First Aid is $11 per person. We are accepting checks or money orders only (no cash). Please call 636-797-3619 to reserve your seat. Cindy with the American Red Cross delivered the Battle of Badges Blood Drive plaque for winning the 2018 Blood Drive with 60 units of blood! Thank you to everyone who came out and donated this year. Good luck next year Cedar Hill Fire Protection District! We are ecstatic for Fire Prevention Month! For the month of October, we will be visiting our schools to speak with children about the importance of fire safety. We will also be sharing fire safety tips that you can share with your family and friends! Did you like the Friday Football shirts that your Hillsboro Firefighters have been wearing on Fridays during Football Season? Now you can get your own! 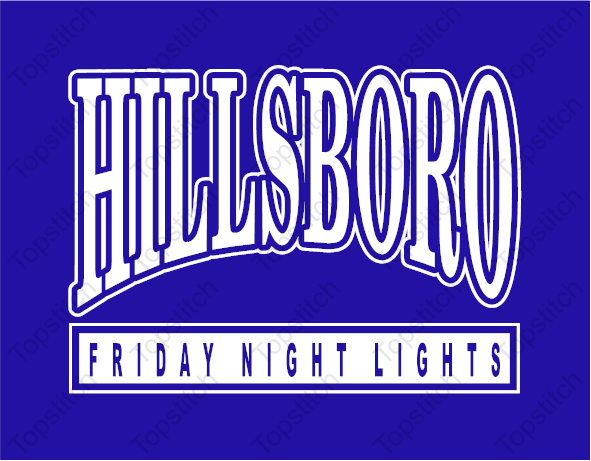 We are proud to introduce the Hillsboro Firefighters Associations, public release of the Hillsboro Friday Night Light Shirts! They will look pretty much like the ones we currently have, with some minor changes. Front and back designs are in the photos below. A link to the order form is below. The Firefighters Association is accepting all major credit cards and Paypal. All proceeds benefit the Hillsboro Firefighters Association, a benevolent organization made up of all your firefighters with one goal, further helping the community! Although the Football season will be quickly coming to an end, these shirts will be good for years to come! ​B crew attended the Jefferson College Go Jeffco Career Day this morning. They spoke to approximately 700 students about how to become a firefighter and what a day in the life of a firefighter is like. We had some great questions and hope to see some of the faces again in the fire service one day. 5 of your Hillsboro Firefighterd, completed the annual Clayton Memorial Stair Climb to honor the 343 Firefighters killed on 9/11/2001. Pictured from left to right in the front row are Firefighter John Safron, Firefighter Shawn Hahl, Firefighter Zach Koeller, Firefighter Beveridge, and Firefighter Stephanie Jackson. In the back are some Festus Firefighters and Desoto Rural Firefighters. They climbed 110 flights of stairs in their full firefighting ensembles. Congrats to all!! A big THANK YOU to DeSoto Rural Fire for inviting us to join them in their live fire training at the Festus training tower. Our firefighters were able to train under realistic conditions with live fire to study fire behavior, how to cool the super heated enviroment, extinguishment, and much more! We look forward to joining them in the trainings to come. Strong work Hillsboro Fire crew! We brought home the 2nd place trophy from the Desoto 4th of July Water Fight. ​BIG NEWS FLASH!! All the results are in and tallied! The Hillsboro Fire Protection District, with the support of our citizens collected 60 units of Blood. Not only is this just a local challenge between Cedar Hill Fire and Hillsboro Fire, departments are ranked and a leaderboard is kept from across the country for most units collected at a Battle of the Badges Blood Drive! Among all the Battle of the Badges Blood Drives across the country, the Hillsboro Fire Protection District has moved into 14th place!! That is not a typo! The Hillsboro Fire Protection District has moved in to 14th place in the nationwide standings! AWESOME JOB ALL!!! The Hillsboro Fire Protection District would like to send a huge THANKS to all of this year's people and businesses who made the Battle of the Badges Blood Drive a HUGE success! Please support your local small businesses!! ​We were very excited to have Lex and Henry join us to be a Firefighter For a Day. They were a great help today with checking trucks, washing trucks, doing gear race drills, flowing water, and training with the thermal imaging camera playing hide and seek. We ended the day with a wonderful grilled lunch by Chief Dave Scott! ​It was a beautiful day for fun in the sun and to cool off in the water! Thank you Good Shepherd Catholic School for inviting us to join you! ​We had a great time at the Hillsboro Intermediate School today!! It was a wonderful day to cool off in some water! ​We were excited to be part of Hillsboro Primary's Field Day today. We had a great time and look forward to next year! C crew visited the Child Development class at Hillsboro Highschool to share fire safety tips on Thursday. Capt. Darian and Firefighter Husky taught the children how to Stop, Drop, and Roll, how to feel a door to see if it is safe, and showed them our gear that we wear to protect us in fires. We would like to thank the Hillsboro Intermediate school for inviting one of our firefighters, Stephanie, as the guest speaker for their #LikeAGirl program. This program is dedicated to creating capable, confident, and respectable young ladies that will be a great asset to society. They were a wonderful group and we hope to be a part of the program again next year. C crew was honored to attend the Dr. Seuss night at Hillsboro's Primary school to read. Kyle read Mr. Brown Can Moo Can You? to the children. We had a great time and hope to attend again next year. ​Yesterday evening, Chief Scott, A/C Gaudet and multiple other firefighters from the Hillsboro Fire District had the honor of attending the Jefferson County Fire and Rescue Training Academy's Firefighter One and Two graduation ceremony! Hillsboro Firefighters, Shawn Hahl and Zach Koeller were among the graduates! Zach and Shawn completed an intensive 4 month training class to obtain Missouri State Certification as a firefighter! Congratulations to them both we are proud! 1. Provide paid staff at station 2 Monday through Friday. 2. Pay off existing debt! We are proud to announce that the Hillsboro Fire District has officially paid off all outstanding debt which resulted from the building of station 2 and purchase of 2 pumpers. 3. Provide a means for capital improvements. We have already purchased a new tanker (2016) and paid cash for the apparatus. We recently put a new brush truck in service which was paid for by 95% grant money. All apparatus have been placed on a replacement schedule moving forward, with replacement plans going as far out as 2030! All promises from the 2015 sales tax have been met and we thank all of our residents for their continuing support! We strive to provide the best services possible with our limited budget! ​"Your All Hazards Emergency Response Agency Serving the City of Hillsboro and Surrounding Areas."